Only a few cruise ships visit Portland, but it'll be an interesting stop, in the heart of the "Jurassic Coast"
You'll port in Portland harbor, former Navy base, home of the sailing events of the 2012 Olympics & not far from the causeway. There are plenty of friendly volunteers in the port as well as in Weymouth where the shuttle drops you off. Make sure you are on deck an hour before the ship departs, as the local people put on quite a show including a brass band and a gun salute from Nothe Fort Artillery Volunteers. The locals sure put their best foot forward, an example for other small cruise ports. Bravo Weymouth! 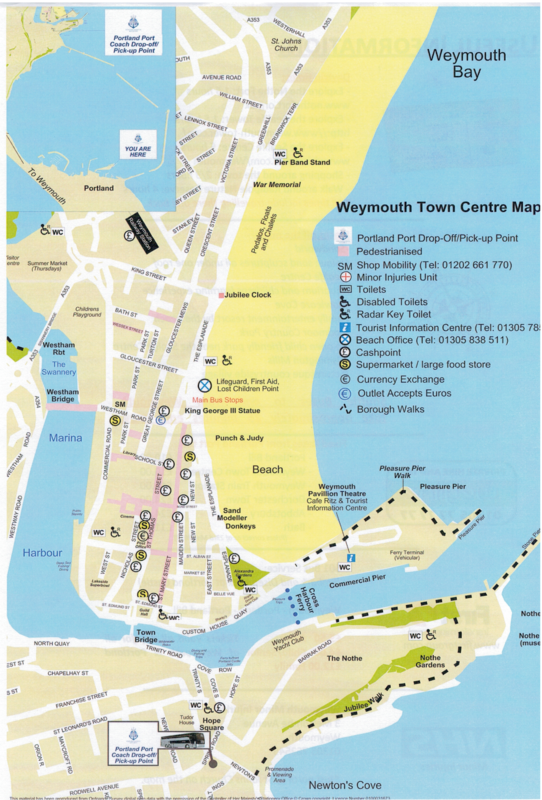 Weymouth is a super little resort with a beach & promenade, interesting harbor, smuggling museum, etc and more cafes, pubs & fish'n'chip shops than you can shake a stick at. Most visitors are Brits. This would be your cheapest & easiest option, and would be a good day if the weather's OK.
Portland Bill is a high & rocky promontory of about 5 sq miles, on the south coast, connected to the mainland by a permanent causeway. Deep into history, it's the reason that "Portland stone" & "Portland cement" have their names, stone quarried here was used for a number of significant buildings in the UK (incl. St Pauls Cathedral) There are still working stone quarries at the top of the Bill. And rabbits. Lots of rabbits. To the west of Portland is 18-mile-long Chesil Bank (often called Chesil Beach), the Portland causeway is the start of it. Behind Chesil Bank is a lagoon called "the Fleet"/"the Flete", a wildlife reserve. And in the bay to the east is the Victorian seaside holiday town of Weymouth, short journey of about 4 miles by bus or taxi, or probably a ship's transfer will be offered. Or explore the Jurassic Coast. West as far as Lyme Regis, taking in Abbotsbury, West Bay & Bridport. Or east to Durdle Door, Lulworth Cove, Corfe castle. You can make a circular route in either direction, using the minor coastal roads & the main A35 trunk road. Or concoct your own route taking in some things either side of Portland/Weymouth. You would need to hire a car, or a car & driver. The X53 route is excellent for sightseeing. All Day Ticket £7.50/adult. Route 501 (£5.00) is operated by an open topped bus during the holiday season, once every hour in the summer season from Weymouth to Portland Bill. Bus Map of the area. 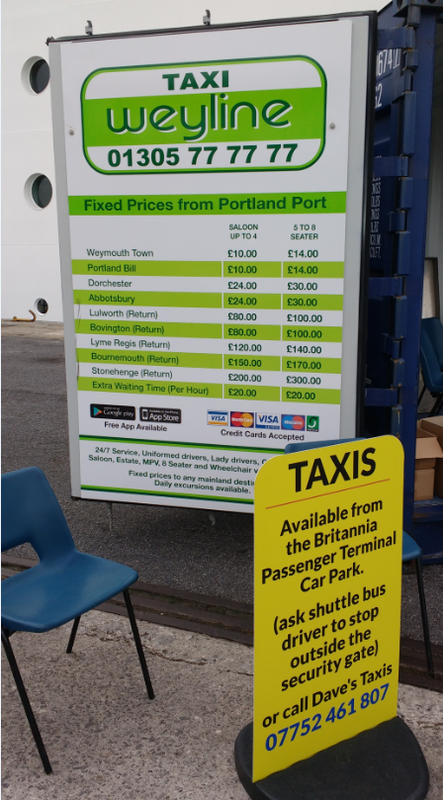 On the way back you can get off at Portland Castle where the shuttle bus also makes a stop to bring you back to the ship. Taxis tours are also available. Bath, Salisbury and Stonehenge are popular as cruise excursions. The main shopping streets in the town are St Mary Street, St Thomas Street and New Bond Street. These are all located at the hub of local transport and within five minutes walk of the beach.